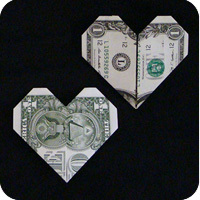 Money Easy Heart is the easiest and fastest way you can make a heart from a dollar bill. It’s not the most sophisticated design, but when you want to impress someone quick, it does the job just fine. So you have been warned: fold only. 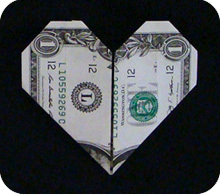 Don’t glue, staple, cut, rip, or punch holes in a US dollar bill! 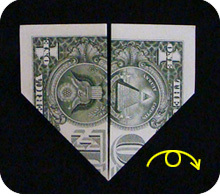 Fold the bottom third of a dollar bill upwards. You need not be exact in measuring the distance. 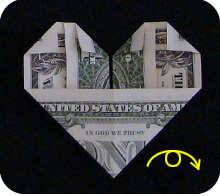 Fold the bill in half. Unfold. Fold the left and right sides of the dollar bill up so the edges align with the central crease made in step 2. 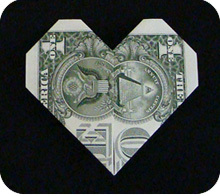 Imagine the top section of the heart to be equally divided in two parts. 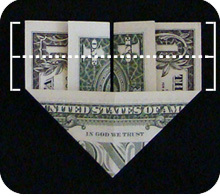 Fold the four top-corners down so they are level with the imaginary half-mark line. 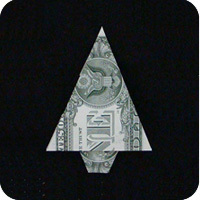 This is how it looks like if you started with the green-side of the dollar bill facing up.